Rather than our normal Monday liturgy post this week, Lee Hull Moses shares some ideas about how to have family worship time on those Sundays when you just can’t make it to church. I’m a big proponent of regular participation in a worshiping community. By all means, get yourself connected to a local church and worship there weekly. It’s good for you, it’s good for your kids, it’s good for the church. But I also know that there are going to be those weekends when you just can’t get to worship. Maybe one of the kids is sick and shouldn’t be around other people. Maybe the car’s in the shop and church is too far to walk. Maybe your summer travels have taken you far from home, and Sunday morning finds you getting ready for a day at the beach or driving home from vacation. So, why not worship where you are? Just because you can’t get to a church building doesn’t mean you can’t worship God together as a family. Recruit your kids in planning the service, maybe even starting the night before. Start by making a list of all the parts of a worship service; just brainstorm, then go back and put it in order. You’ll probably want to include some kind of opening call to worship, some music and singing, a time for prayer, scripture reading and some kind of response, and a closing. If you’ve got older kids and good readers, you could divide the parts onto index cards and let everybody pick a part to lead. The opening could be as simple as one person saying, “Welcome to worship!” or you could write a responsive reading. Singing “This is the Day that the Lord Has Made” also makes for a good opener. Then keep singing: if you’ve got a hymnal around, pick out your favorites. If not, sing the ones you know by heart: “Jesus Loves Me,” “Zaccheus,” whatever your family favorites are. If you’ve got crafty kids, recruit them to make a song book ahead of time. There are lots of ways to make space for prayer: let everybody share a prayer request, or write down your prayers. Read the Lord’s Prayer together. Or do a body prayer — hands at heart to center ourselves, hands reaching up to God, hands out to our neighbors. Do a repeat-after-me-reading of a Psalm. We used Psalm 100, which includes a lot of shouting. So we shouted. Collect an offering and send it to church later. Or make an offering of promises — invite everyone to name one kind thing they will do for someone else this week. Keep in mind – and remind the rest of the family – that this is worship, not a performance. It doesn’t have to be perfect, nor does it need to go exactly the way you planned. When my kids and I did this, I had to referee a number of squabbles between my six-year-old – who had carefully planned the entire experience, down to the seating arrangements – and my two-year-old, who was not inclined to follow her instructions. It was helpful to me to remember that sibling rivalry is nothing new to the people of God (see Cain and Abel, Jacob and Esau, Joseph and his brothers, Mary and Martha, the prodigal son and the older brother). It wasn’t always pretty, but it was worship. Find yourself traveling on Sunday morning? How about worshiping in the car? 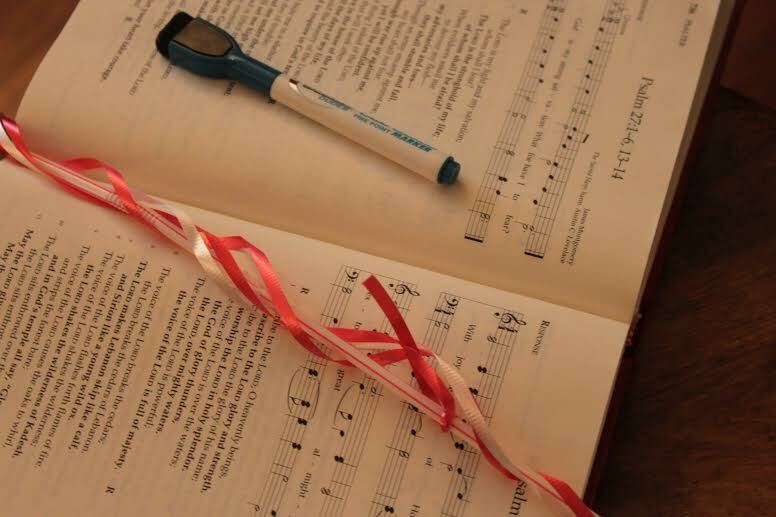 Have an old fashioned hymn sing and let everybody take turns picking a song. Sing as much as you can remember, and don’t worry about getting all the words right. Make a list of things you’re thankful for and take turns sharing. Talk about Sabbath-keeping, and why it’s good to take a rest. Write a “Psalm for Vacation” — praise God for sun and sand, or mountains and rivers, family and friends. Have everyone (except the driver!) write down one hope they have for your time together (if you’re on your way out of town), or one way you’ll hold on to Sabbath time once you get home. Close with a round-robin prayer and give thanks for the presence of God, who meets us wherever we are.